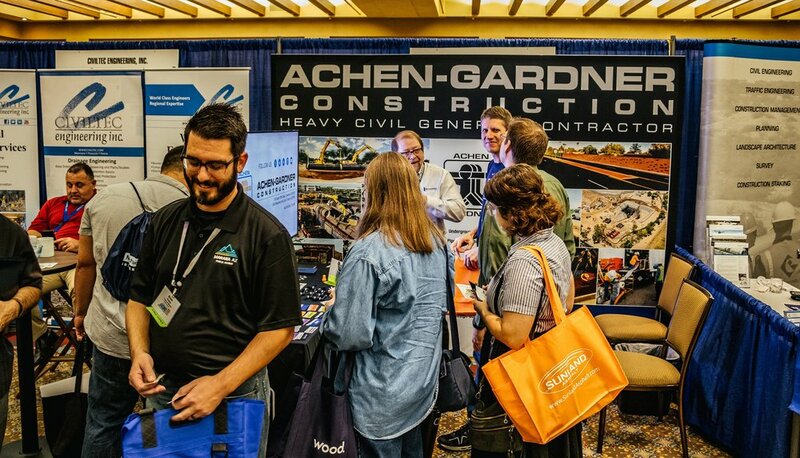 Achen-Gardner Construction was a sponsor, exhibitor, and several of our employees attended the Arizona Chapter American Public Works Association (APWA) Statewide Conference on August 1-3, 2018, at the Hilton El Conquistador in Tucson, Arizona. In addition to being a Premium Sponsor, Public Agency Sponsor, and Friday Prize Drawing Sponsor, we showcased recent projects and handed out lots of goodies and giveaways at our booth. We raffled off an Amazon Echo and drew the winner at the official prize drawing. Congratulations to Scott Leska with the Town of Marana for winning the prize. At the Awards Luncheon on Thursday, August 2, Achen-Gardner representatives accepted Project of the Year Awards for two of our projects: the Wastewater Conveyance JOC project for the Pima County Regional Wastewater Reclamation Department (winning in the category of Environment - More Than $75 Million) (see photo below) and the Edison Road Extension CMAR project for the City of Maricopa (winning in the category of Small Cities/Rural Communities - Transportation) (see photo right). Congratulations to all of our team members and partners on these projects. Click this link to see photos of the AZ APWA Statewide Conference Fun Night!